Tshaka Campbell has been writing and performing his work across the globe for over fifteen years, from the Apollo Theater in NY to the O2 in London. His work has been published in magazines, poetry anthologies and periodicals as well as in a number of global advertising campaigns. He has authored two books, three spoken word albums. He currently resides in California and continues to ask the world to listen different. Suzy de Jesus Huerta is a composition writing professor and poet from San Jose, CA. She is a two-time VONA alumna (2010, 2012). Her work has appeared in: La Bloga, The Packinghouse Review, Poets Responding to SB1070, Bordersenses, Poetry of Resistance: A Multicultural Anthology in Response to Arizona SB 1070, Xenophobia, and Injustice, and other journals. Suzy currently curates the new reading series, Oakland Crossroads, at Studio Grand in Oakland, California. She lives in San Francisco. Sanjay Mathur has been writing thought-provoking essays, stories, poems and nazms since his childhood. He was born and brought up in the heartland of India where Hindi and Urdu are spoken as Hindustani. Having lived in Singapore and Australia, he now calls Campbell, California his home. Professionally, he is an IT Risk and Security Leader. Whenever he gets time from his professional obligations, he composes his expression in Hindustani and English. 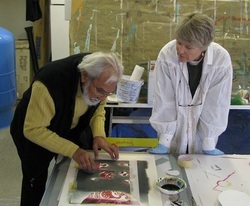 Some of Sanjay’s work was published in The San Jose Mercury News, renowned Indian magazines, British Journals, and on literary websites over the years. Salma Arastu, is a published poetess and a renowned artist specializing in paintings and sculpture, from Berkeley. She has won several awards including East Bay Community & fund for artists in 2012 and 2014, and City of Berkeley Artist’s grant in 2014-2016. Her two outdoor sculptures and several paintings are in public places and four books with poems and paintings have been published. Dard Ki Seedhiyan in Hindi (1981) The Lyrical Line: Embracing All and Flowing (2008), Turning Rumi: Singing Verses of Love Unity and Freedom (2012) and Celebration of Calligraphy (2014). A catalog was published in 2015 of her new series “Unity of Sacred Texts and Symbols”. Her art and poetry speak of human universality. Rekha Maitra is a prolific poetess and has published eleven books of poetry in Hindi. She has a Master of Arts (MA) in Hindi literature from Saugar University. She worked with the American Peace Corps for a short period as a language instructor assisting the Peace Corps volunteers while teaching them the regional language.Her passion is poems. She has participated in various literary conferences held in the US over the past several years Her poems are primarily focused on the inner feelings of human emotions as influenced by nature, love, and various experiences of real life. Rekha Maitra currently resides in Los Angeles. Pallavi Sharma is a multidisciplinary artist and her research interest concerns Asian American women's cultural production, feminist pedagogy, and activism. 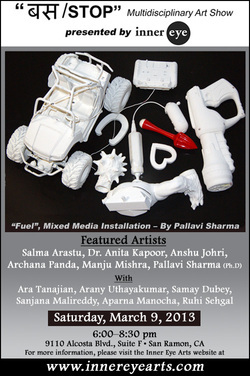 Pallavi's work has been exhibited widely at venues including the Queens Museum of Art, Exit Art, Art Asia Pacific, and Bishop Museum. 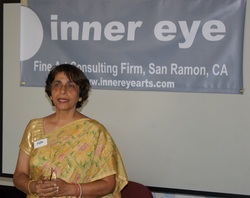 At present, she is a board member of Asian American Women Artist Association (AAWAA) and Director of ‘Inner Eye" nonprofit art organization, San Ramon, CA. Pallavi received BA (Fine) and MA (Fine) from at the Faculty of Fine Arts Baroda, Department of Art History and Aesthetics, and her Ph.D. from National Museum Institute of History of Art, Museology, and Conservation. She teaches at California College of the Arts. Lita Kurth holds an MFA from Pacific Lutheran University and has published work in three genres. Her CNF, “Pivot,” was nominated for a Pushcart Prize. Her CNF “This is the Way We Wash the Clothes,” presented at the Working Class Studies conference, 2013, won the 2014 Diana Woods Memorial Award (summer-fall 2014) and appeared in Lunchticket 2014. Her flash fiction, "Gardener's Delight" (Dragonfly PressDNA) was nominated for a Pushcart Prize. She teaches at De Anza College and in private workshops, and in 2013, she co-founded the Flash Fiction Forum, a reading series in San Jose. Kalamu Chaché was born and raised in Brooklyn, New York. Since her residency in East Palo Alto, California, Chaché has served the greater East Palo Alto community in numerous professional, executive, administrative, advocacy, and artistic areas of employment and volunteer services for a variety of community-based programs, causes and events specializing in youth/community development and the literary/performing arts in the San Francisco Bay Area. Chaché currently serves as a Cultural Arts activist, advocate, producer, promoter, author, educator, vocalist, songwriter, recording artist, performing artist, and Poet Laureate of the City of East Palo Alto. Jenn Lee Smith has an MA in Human Geography and pursued a PhD for a time studying migration of women in China and Silicon Valley. She is a grant writer for nonprofits, contributor to Mochi and Hyphen magazines, and producer for a short documentary film released this summer titled, You and I, Friend. Anshu Johri authors short stories, poems and plays in English and Hindi. She has a M.S in Electrical Engineering from San Jose State University, California. Her work in English has appeared in Dukool, Vine leaves Literary Journal, Calliope, Creation and Criticism and an anthology Desi Girls published by Hope Road Publishing U.K. Her published works in Hindi include, poetry collections: Khule Prishtha (Bare Pages), Boond ka Dwandwa (Dilemma of a Raindrop), and short story collections- Shesh Phir (More Later…), and Adrishya Kinara (Invisible Shores-). Her rendition of “Adrishya Kinara” is now available as an Audiobook at CDbaby.com, Audible and Itunes. Her poems and stories have appeared in reputed Hindi Literary Journals of the world. Besides writing, her other passions are theatre, painting and music. Anita Kapoor is a published poet, author, a social activist and a Vedic astrologer. She has a Masters of Art in Hindi and English from Delhi University, and a PhD in English from Meerut University. 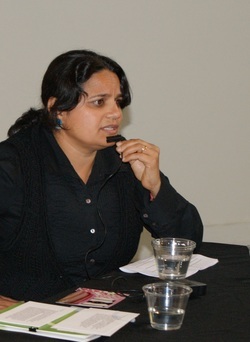 Her published work includes Bikhare Moti, Kadambari, Achhute Swar and Os mein bhigte sapne (Poetry - collections). Her work has also appeared in reputable magazines of India and U.S.A.
San Ramon, CA: Inner Eye is pleased to present a group show titled Liquid Stories by artists of Asian descent. 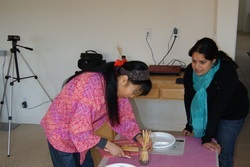 The show is part of Asia Week, San Francisco. ​'Liquid stories' brings the works of twelve visual artists who take a great freedom to explore their subjects in a state of flux. They constantly grapple with the depiction of intricate narratives, which move along with the human mind and body, in the form of memories and experiences. The exhibit is aligned with the views on change and flow propounded by ancient philosopher Heraclitus of Ephesus, and the vision of a chaotic world in perpetual change and becoming by Friedrich Nietzsche. The intention of the show is to create a fluid space of creative engagement and generate an open-ended visual discourse on the subject. The show includes a collaborative community art project “Meghdoot” with Artist Pallavi Sharma and over thirty participants from San Ramon and Fremont area. 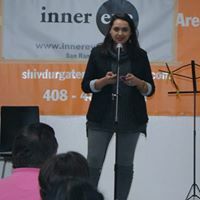 Inner Eye cordially invites you to "Laugh Riot" an evening to laugh out loud, featuring bay area’s best English and Hindi stand ups, writers, and performers! Followed by a Pizza Party!! Samason was born in Mumbai and raised Jewish. Growing up in the world's most crowded city, he spent most of his childhood years burning the midnight candles for earning a Masters in Computer Software, thereby fulfilling his parent's dreams. He then moved half-way across the world, to the technology headquarters and a hotbed for emerging comics - San Francisco. As a first generation immigrant in America, Samson brings a refreshingly new approach to cerebral, witty, thought-provoking, clean humor with a global perspective. Driven by personal trials and tribulations, his subtle satire addresses religious and political hypocrisies, social issues, and day-to-day absurdities of human nature. He has performed at clubs, colleges and corporations in India, Canada and 13 states in U.S. & has been featured on Asian Jewish Life, Indian Express, NBC Bay Area, CBS and NPR. Join us to to explore the rich and diverse flavors of Hindi through poems, narratives, reading performances and much more. 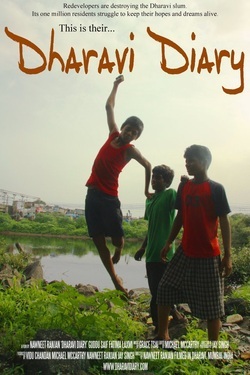 ‘Naya Pata’, the debut film of the director Pawan K. Shrivastava. It is an innovative film which tries to capture the emotional insight of a person during and after migration. The film, as the name suggests, signifies the quest of a person in search for his own identity which leads him to discover a new address of life. It’s a story of the loss and subsequent search for one’s identity, something we can all relate to. 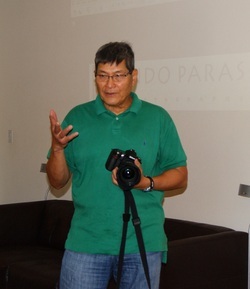 Have made 2 documentaries and few short films, Naya Pata is the Debut feature film. 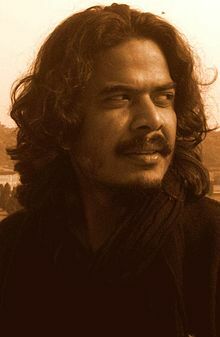 Currently working on his next feature titled “Haashiye Ke Log” based on Marginalized section of the Society. The show brings together Asian American artists who are constantly exploring the new ways to comprehend the complexities of class, gender, and ethnicity. They address the issues from multiple perspectives and challenge the traditional ideas of identity formation through new themes and innovative mediums. The intention of the show is to create a fluid space of creative engagement and generate an open ended visual discourse on the construction, and reconstruction, of identity. Works in the exhibition includes small installations, printmaking, performance and mixed media works with participatory intent. "On body and place: A survey of her work that addresses concepts of displacement, migration and finding stillness within change"
Nirmal Raja is an interdisciplinary artist and associate lecturer at UWM. Born in India, Raja has lived and travelled in several countries. Raja received a Bachelor's of Arts in English Literature in India, a diploma in Graphic Design from the Moore College of Art and Design in Philadelphia and a Bachelor's of Fine Arts in Painting at the Milwaukee Institute of Art & Design. 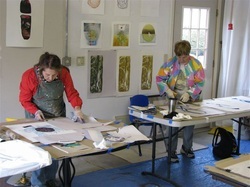 She received her Master of Fine Arts degree in painting and drawing at the University of Wisconsin Milwaukee. She is a resident mentor at Redline Milwaukee and has recently received grants from the Wisconsin Arts Board and the Milwaukee Arts Board supporting the exhibition Transitions in Perspective: Myth and Mirror at Redline Milwaukee. Presentation by - Nawneet Ranjan- Slum Innovation Initiative. Nawneet is film maker and social entrepreneur who uses inherent indigenous ingenuity and stories of community to bring change. The show brings together the works of established and emerging voices of South Asian and Middle Eastern Diaspora to confront the culture of violence through creative arts. The aim is celebrate the power of creative resistance, collective harmony for healing, and transformation.